so.. each week i will try to highlight a lesson whose source i otherwise might have forgotten... things i am grateful my mother taught me about cooking. when you zest an orange, or other citrus fruit, use the right tools at the right angles to ensure you get the zest (the colored, oily part of the peel) and not the bitter white pith. 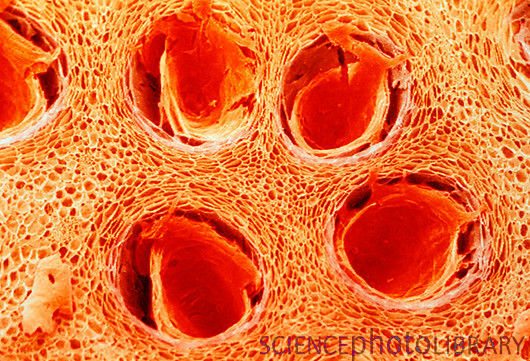 ...also known as trichomes, round, concave, glandular epidermal cells specialized to secrete orange oil. to zest an orange, you drag a citrus zester across the skin to remove strips of the orange zest while avoiding the white pith. it is handy for creating long beautiful curls of citrus zest (with practice!) to garnish drinks, cakes, and other citrusy delights, but it requires skill and patience to angle the zester just-so, to ensure you don't get loads of bitter white pith as well. 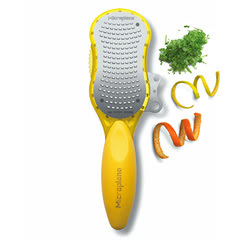 for major zesting operations (we're talking a teaspoon or more here, people), i highly recommend a microplane grater. 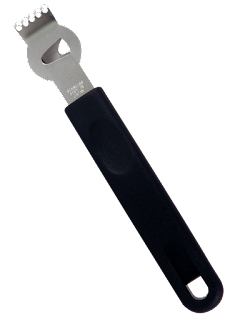 the microplane citrus tool is great because the zesting blades are small enough and angled so that you can basically just rasp your citrus fruit to heck and not get any pith at all. just make sure that as soon you see the pale fibrous pith showing through the zest, you move on to the next area. see the lighter colored spot on the right? i came pretty close to the pith there. and there you go... lots of aromatic, flavorful zest, full of orange oil, without any bitter pith. now what will you make with it? p.s. check out this awesome tip from thekitchn about maximizing the flavor of your zest!! Your feelings about your mom are identical to mine. Every time I make a salad especially, because that was my job as a child and I loved having those predictable moments every day when I would rub shoulders with her. Wonderful. And the zest info is helpful, too! i use zest in just about everything! it really adds something extra to most dishes! This is such a great post! Very clear and very helpful!Thanks. I'm glad it is helpful.. I thought the magnified photo was fun :) Thanks for visiting!